Describe about the organization Starbucks? The organization selected for analysis is Starbucks. Starbucks is one of the best known coffee company and coffee house chain in Washington. The main products which are sold by Starbucks are hot and cold coffee beverages, whole coffee beans, pastries, snacks and etc. Starbuck is also having an entertainment division like books, music and etc which are sold in large number in market. Starbucks tries to implement the product improvement strategy by creating well suited product line. They also implement lean techniques and staff development for achieving operational excellence (Thompson and Lonnie1999) and improving their staff skills. Staff development in Starbucks is done by providing training. 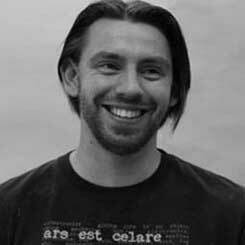 They also focus on improving quality of services provided by them to customers. Starbucks main objective is to open 50 more outlets in less than 4 years and increase their market share by 75%. Starbucks organization also works on creating brand awareness (Alfie 1993) in the market which will help them to increase their market and profit share. To make Starbucks as a best supplier of finest coffee all over world through maintaining unbending principles . Starbucks was founded over 20 years before and after that company has rapid growth so Starbucks is in mature stage of its lifecycle. 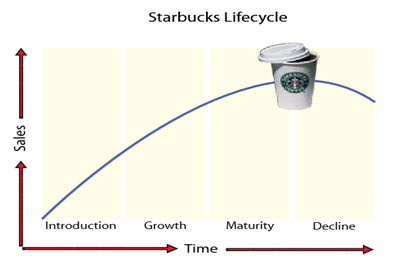 The lifecycle of Starbucks shows the increase os their sales in relation to time or years. To analyze the environment in which the Starbucks works in comparison of other industries or organization PEST analysis is used. PEST analysis is used for analyzing the external and internal environment of the organization. Starbucks adopted different strategies for marketing, production and selling. For marketing organization first analyze the market using different factors like geographical factor, etc. Political factor is used to analyze whether the Starbucks is following all the rules and regulations of government (Beardwell and Claydon, 2010). Every country has its own rules and regulation for industries and every industry has to follow it(Martin, 2008).Organization has to work according to the changes made in rules and regulation in law made by government. Organization economy can be affected by different economic variables like country’s economy, inflation, change in price of coffee beans, labor price changes, countries income per capita and etc (DeNisi and Griffin, 2011. Organization has to work by making sure that the environment is not affected by its different operations (Eigenhuis, Dijk and Eigenhuis, 2008). Starbucks while production of their coffee products should not pollute the environment. Social environment should not be affected by any operation of Starbucks. Organization has to keep himself updated regarding the technology in comparison of other industries to increase their profit share. Technological in relation to Starbucks can be the machines used for extracting coffee from beans and other similar machines. The key factor of Starbucks success is there people i.e. employees and customers (Dickmann, Sparrow and Brewster, 2008). To motivate employees for achieving the organization goal they analyze the employee’s strength and specialty and then assign task or job according to that by which employees will like working for organization benefit and profit. In case of recession in the industry company take decision which is beneficial for both organization and employees both, this increases the level of trust and loyalty of employees for Starbucks. Starbucks buy coffee beans from other resources sometimes so to increase their business, there should be a sustainability plan taking into consideration all their customers, employees and vendors. Beardwell, J. and Claydon, T. (2010). Human resource management. New York, NY: Pearson Financial Times/Prentice Hall. DeNisi, A. and Griffin, R. (2011). HR. Mason, Ohio: South-Western. Dickmann, M., Sparrow, P. and Brewster, C. (2008). International Human Resource Management. Hoboken: Taylor & Francis. Eigenhuis, A., Dijk, R. and Eigenhuis, A. (2008). HR strategy for the high performing business. London: Kogan Page. Martin, J. (2008). Human Resource Management. London: Sage Publications.